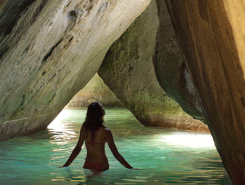 • How long does it take to get to the BVI? Much depends on weather and specific location. In general, on a calm day and motoring at a moderate speed, the trip from Red Hook to Jost Van Dyke takes about 40 minutes. Other popular destinations in the BVI include Tortola, Norman Island, Peter Island, Virgin Gorda and hundreds of small islands and cays in between. • What do I need for BVI customs? 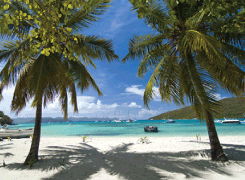 For BVI customs, you'll need a valid Passport. This requirement is subject to current BVI regulations, so be sure to ask when booking reservations. • Are there areas that I may not travel to? Yes, certain areas are off limits for our boats due to navigational hazards such as shallow reefs and shoals. • How will I know where to go? Before departure, you will be given a detailed briefing of the touring area. Copyright © 2019 NAUTI NYMPH POWERBOAT RENTALS - St. Thomas Power Boat Rentals. All Rights Reserved.